This is the third edition of my paper. The first one was sent as a brochure “Returning to the Enigma of Plato’s Atlantis” to Ancient History Departments of some Universities and to Geographical Societies of a number of countries in June 1995. The magazine version of it has come out in the May 1996 issue of “Vokrug Sveta” (“Around the World”, Magazine of Travels, Adventures and SF) – a kind of Russian “National Geographic”. The second one was published in some newsgroups and mailing lists in February – March 1996. In the present edition I am trying to provide answers to most of the questions I was asked after those publications. Besides, I have since found some materials illustrating some of my suggestions. I would like to apologise for some prolixity of the introduction and maybe the slightly simplified style of setting forth some theses, which are due to the fact that the paper is meant not only for experts on the issue, but also for those who are not familiar in detail with a whole range of issues connected with the subject. The two translations of Plato’s dialogues Timaeus and Critias used are the Thomas Taylor translation first published in 1804 and considered to be classic (Plato. The Timaeus and the Critias or Atlantis. The Thomas Taylor translation. N.Y., Pantheon books, 1944) and the Desmond Lee translation, first published in 1965 (Timaeus) and in 1971 (Critias) (Plato. Timaeus and Critias. Penguin books, 1994). I also had parallel texts of the dialogues in ancient Greek and in Latin (Platonis Opera. Graece et latine. Paris, 1877). Where not specified, Desmond Lee’s translation of Plato is quoted, since his language is more up-to-date. After quotations in round brackets, it is indicated where in Plato’s text the passage quoted belongs according to the traditionally accepted pagination. The Greek words given in the explanation of quotations have been transcribed with Latin letters by the author because of the ASCII-codes format. The bold type in the quotations and the explanations in square brackets are mine. •M.V.Dyakonova of the Institute of Scientific Information on Social Sciences of the Russian Academy of Sciences. Plato speaks of Atlantis in two works – dialogues Timaeus and Critias. Dialogue was a genre widely popular in Ancient Greece, in which information or ideas are not narrated by the author himself, but are presented to the reader by two or more interlocutors addressing each other. Such a genre is convenient for presenting differing views on the same subject and, besides, makes it possible to render the experience cited in support of the deliberations, concrete to the utmost. Therefore, the genre of the ancient Greek dialogues should not be seen merely as short-hand records of actual conversations. In both dialogues the story of Atlantis is told by Critias, Plato’s maternal great grandfather, narrating word for word the conversation between Solon and an Egyptian priest. In Timaeus the issue of Atlantis is raised along with many others, while the unfinished Critias, in all probability, was to be exclusively devoted to it. Critias also explains how he himself came to hear the story. He heard it from his grandfather whose name was also Critias, who, in his turn, had heard it from Solon himself, who had been a close friend of his father, Dropides. In his conversation with Solon, the priest, referring to the sacred records, speaks of a powerful country, Atlantis, lying outside the Pillars of Hercules, of the beginning of a war between Atlanteans and the citizens of Athens and of a catastrophe which destroyed both, and resulted in Atlantis sinking to the bottom “in a single dreadful day and night”. The priest also says how many years have elapsed since – nine thousand years. Besides, Critias contains the myth of the origin of the rulers of Atlantis, the description of its geography, architecture and of its social life, all of which suggests the idea of imagination having been used to make up for the lack of information. It is estimated that the dialogue took place around the year 425 B.C. (Plato himself must have been about 2 years old at the time). Critias-grandson, Plato’s great grandfather, was probably about 80 at the time, and he had heard the story about 70 years before (i.e. around the year 495 B.C. ), from Critias-grandfather, when the latter was about 90. Since Critias-grandfather had heard it from Solon himself, who belonged to the same generation as his father, it can be reasonably assumed that the conversation between Solon and the Egyptian priest took place around 600 – 575 B.C. Thus, it follows that, according to Plato, Atlantis vanished in the middle of the 10th millennium B.C. Hardly anyone in the world knows exactly how many books have been written about Atlantis by the proponents and opponents of the idea that it once existed. Those who have attempted to count them, come up with widely diverging, albeit invariably four-digit numbers. No doubt, the topic of Atlantis could claim its place among he best-selling topics of the current century. The special attention that Plato’s narration about Atlantis gets can be accounted for by the fact that the country described in Timaeus and Critias does not fit in with our present-day ideas of the history of humanity, and the date of its vanishing, as recorded by Plato, goes back to unprecedentedly early times. If we treat this narration as trustworthy, a new and more comprehensive model of the history of mankind’s development is essential. The idea seems attractive to many, in view of the numerous blank spots and contradictions in the existing concept of the history of humanity (for instance, such as the vast span of time between the emergence of an anatomically modern Homo Sapiens and the development of the first civilisations), all the more so, that the text which could bring about a revision of the existing model is authored by Plato, who stands with Socrates and Aristotle as one of the shapers of the whole intellectual tradition of the West. At the same time, Plato’s narration about Atlantis stands by itself, it is not directly corroborated or indirectly echoed by anything, and in itself does not give sufficient grounds for such a revision. In the upshot, the problem has become something of a scientific curiosity. Even if scientific data coming to light as time goes by, are interpreted in the context of Atlantis, as a rule, it is done in a biased way and has little in common with a balanced scientific approach. Without claiming to present an exhaustive survey of the existing viewpoints on the issue, I would like to list only the ones I believe to be the most widespread. • Some believe that Atlantis is Plato’s invention from beginning to end, which he needed to expound his ideas of an ideal state. • Others, who do not consider Plato’s narration to be an invention, persevere in trying to interpret it in a way which would make it possible to link it with the already explored archaeological sites. Thus, some of them contend that none other than the island of Crete is Plato’s Atlantis, claiming also that Greeks used the name of the Pillars of Hercules, mentioned by Plato, not for what is now called the Strait of Gibraltar, but for some rocks which were situated on the way from Athens to Crete. Given such an interpretation, it becomes imperative for them to bring the date of the vanishing of Atlantis given by Plato, in line with the time of the decline of the Minoan civilisation, established by archaeologists, and link it to the explosion of Thera/Santorin. Hence, rise is given to the hypothesis that the span of time between the vanishing of Atlantis and the conversation between Solon and the priest is actually 10 times shorter, and that the mistake was made either when Egyptian priests were copying the sacred records (it is suggested that the characters denoting 100 and 1000 in the Egyptian hieroglyphic system of writing are alike) or because Plato himself, like all his contemporaries, had little sense of time and dating. The same thesis of a mistake of multiplication by ten is used by the proponents of the Cretan Atlantis as regards the dimensions of the island, for the numbers Plato gives in Critias do not quite fit in with their theory, to put it mildly. Similar arguments are used to substantiate a variety of hypotheses, including some according to which Atlantis was situated not even in the Mediterranean Sea, but in the Sea of Marmara or the Black Sea. • Yet others, fervently believing in the truthfulness of the information provided by Plato, rush to search for Atlantis in the Atlantic Ocean. They have already announced, at different times, that the Azore, Canary and Bahama Islands, as well as some other more or less suitable ones, are the remains of Plato’s sunken island. They also like to juggle with suggestions of mistakes in the numerals as regards the dimensions of Atlantis. I will endeavour to analyse once again Plato’s narration, comparing its basic elements and their interpretations with some fairly credible facts, and suggest for your consideration one more hypothesis, which, in my opinion, hardly has more weak points, vulnerable to criticism, than the already existing ones. First of all, it is highly doubtful that Plato would have had to invent Atlantis to expound his ideas of an ideal state system, – indeed, he had previously expounded them more than once in his other works, without any geographical hoaxes. Secondly, in Timaeus itself there already exists – and is actively used by Plato – an object only too suitable for setting forth utopian concepts – the pre-historic Athens, so the supposition that Plato needed to invent specifically for the purpose a second, let alone such an exotic one as Atlantis, seems rather far-fetched. Thirdly, the explanation of how the information of Atlantis came to Plato’s notice, does not seem to contain logical contradictions, which in itself enhances its credibility. It also sounds convincing that events of such ancient history are narrated to Solon by none other than an Egyptian priest, and the way he explains why Greeks had lost their historical memory. Any assumption that Solon made a mistake in reading the Egyptian hieroglyphs he did not know sufficiently well, should be discarded as Plato explicitly says that he did not read the sacred records himself, but was told of their contents by the priest. Another reason for the mistake of multiplication by 10 might have been the misunderstanding by Solon of the numerals in the Egyptian priest’s story, which is highly improbable, since, firstly, there are several numerals in the story, and, secondly, the spans of time which these numerals describe are interrelated in the priest’s story. However, if we do assume that Solon misunderstood the priest, it would be difficult to imagine an Egyptian priest who, around the year 600 B.C. gives the age of civilisation in the Nile Valley as 800 years. And it would be an outright impossibility to assume that sacred records could have contained such nonsense, and that “nine thousand years” only appeared in the story in the process of copying, as a result of an accidental substitution of the character denoting thousands for another one, denoting hundreds. Yet another argument against the alleged mistake of multiplication by ten is the fact that none of the sources dealing with the second millennium B.C., contains any reference to what is described by Plato in his narrative about Atlantis, and consequently, either his narrative, after all, is a hoax, or it is really a case of information lost and accidentally retrieved – information going back to a much earlier period. In Critias it is said that the capital city of Atlanteans is surrounded by a plain 2,000 x 3,000 stades (approximately 385 x 580 km). As we have already said, proponents of various hypotheses requiring some adjustment of Plato’s data to suit the existing convenient sites, are fond of using the assertion of a numerical mistake consisting in the multiplication of numerals by ten, not only as regards the time, but also the dimensions of the plain. That is why everything we said above about such a method of interpreting Plato being unable to stand up to criticism from the viewpoint of logic, is applicable to these figures, too. And in general, if it is suggested that almost all the numerical data are erroneous and should be revised, then, in my opinion, the whole thing becomes somewhat absurd: would it not be easier to cross out Plato’s narrative of Atlantis and write their own instead, the parameters of which would be acceptable for them. There is yet another argument testifying to the fact that there had never been any mistake of multiplication by ten as regards the dimensions. Plato said that Atlantis was “larger than Asia and Libya combined” (Tim. 24e). Even if we presume that Asia here stands for what is now called the Near East – just a small part of the Asian continent, and Libya – for a small part of North Africa, it is difficult to believe that Plato would describe a territory several dozens kilometres wide, as larger in size than the two of them. In Plato’s time, ancient Greeks used the name of Gadirus for the city which was situated where modern Cadiz stands now, on the Atlantic coast of the Pyrenean Peninsula. How much must the proponents of the Cretan hypothesis want to adjust Plato’s narrative to that hypothesis, to find on the way from Athens to Crete some rocks which allegedly were called the Pillars of Hercules. 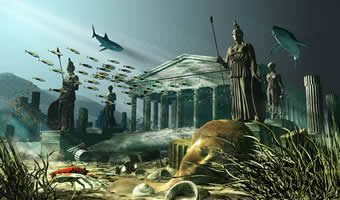 Had such rocks really existed, and had the Island of Crete really been Atlantis, then for the Egyptian priest its inhabitants would have been those who lived “inside the Pillars”, while the inhabitants of Athens would have been those who lived “outside the Pillars”. If we accept as trustworthy Plato’s data concerning the time when Atlantis existed, and its dimensions, and if we resist the temptation of placing this enigmatic land somewhere in the Mediterranean Sea, a question arises of where in the Atlantic it was situated and where it is possible to find some evidence of its existence there in the past. According to geological data, there had been no rising or sinking of the earth-crust in the Atlantic Ocean area not only in the last dozens of thousands, but even in millions of years, that would be commensurate with the sinking of a big island or a small continent. The map of the Atlantic itself bears it out graphically: the outlines of the continental platforms of Africa and South America fit in ideally; similarly, North America, Greenland, Scandinavia and Europe make up a perfectly fitting mosaic, in which there simply is no room for an allegedly lost fragment (particularly of such dimensions as Plato described). All the edges of the continental shelf facing the ocean also coincide with the bends of the Mid-Atlantic Ridge, and the earth-crust rift zone itself, from which continents are “sliding apart” (See map of Northern Atlantic). • secondly, the impossibility of reliably taking into account the changes of the absolute altitude of an area, caused by the geological risings and sinkings (though for these datings test samples from relatively stable platform zones are used). The 200 metres isodepth line on the map of the Atlantic Ocean gives an approximate idea of how the coastline must have looked at that time. It can be seen that in the area of the present Azores and Canaries, which are most often pointed out as the remains of the sunken Atlantis, there had been no sizeable land area (See again map of Northern Atlantic). It can also be seen that in the west of Europe, where now the North Sea is situated, and around the British Isles, during the last Ice Age there had existed a vast area of land, large enough, without any stretch, for a plain two by three thousand stades (See map of the Celtic Shelf). It would seem appropriate to assume that, in being retold and passed so many times over, and in being translated from language to language, and in attempts to grasp the information through the prism of geographic realities which had already changed, a reduction of such notions as “land, territory, country – island” might have taken place. After I have criticised unwarranted assumptions in the Mediterranean hypotheses, and assertions that mistakes had been made in the numerals, the readers may now reproach me for considerably stretching a point in interpreting Plato’s narrative. That is why I would like to quote several passages, which, I believe, substantiate the legitimacy of my assumption, if in reading them we abstract ourselves from the word “island” (which I for convenience shall write in slash marks), focusing instead on the context in which it is used. As we see, the description is rather contradictory. The thing is that in the Greek text, after Critias says that having described the city, he will proceed to the narration of the nature of the rest of the territory tes d allas khoras os e phusis, he actually returns to the description of the city as the place topos situated high above the sea level, from which it rises precipitously, after which he contrasts it de with the flat plain surrounding the city. Such an interpretation of the logic of the passage is borne out by the use in the same passage of two words – khoras and topos, which semantically must refer to different notions, hence, it was only the city that was situated high above the sea level, but not the plain. And again there is no indication whatsoever of land surrounded by the sea on all sides. The only image evoked by this description is that of a city on a hill rising precipitously from the sea, and the flat plain surrounding it, enclosed on three sides by mountains. This description suits in every detail, the land that once existed in the west of Europe: the mountains are the present Ireland, Great Britain and, possibly, the north-western part of France; the plain itself, which now constitutes the shelf to the south of the British Isles (sometimes called the Celtic Shelf) fits the dimensions specified by Plato, and the edge of the continental platform faces south-southwest. At about 48 d 25-30′ N and 8 d 45-51′ W, not far from this edge, there is a remarkable underwater hill called the Little Sole Bank marked on sufficiently minute maps. The top of the hill is 57 metres below the sea level, while the average depth around it is 130 – 160 metres. The hill is located approximately in the middle of the greater length of the plain in question (See again map of the Celtic Shelf). Of course, the coastline of any island should form a closed circuit, and its length can be roughly estimated, as well as the width of the island. Plato’s Critias, however, while giving in minute detail the dimensions of the plain adjoining the city, and giving the length of the canal encircling it, says nothing of the dimensions of the island as such, except that it was “larger than Asia and Libya combined”. Besides, it is not quite clear to what we owe the emergence of the stereotype, according to which Atlantis was situated “to the west” of Gibraltar, or “facing” it. The Greek preposition pro used by Plato in this passage means only that the island was situated “before” the strait, i.e. outside the Mediterranean, which means that the logical extension of its meaning towards denoting “immediately beyond”, “right before” or “facing” (which gave rise to the traditional “to the west of”) – is nothing but the second-guessing zeal of Plato’s translators. Let us also note that nowhere does he speak of the territories controlled by Atlanteans in terms of areas, describing only the length of the coastline. In all probability, it is connected with the geographical outlook of the time, shaped by the fact that people travelled mainly by sea, and maybe also by the specific features of population distribution in conditions of the Ice Age. Let us now once again return to the already quoted passage about the distribution of allocations between Poseidon’s sons. Taylor’s translation in this case is closer to the original, since the Greek epi to, like the Latin pars ad, almost always means “as far as to”, “right up to”, “bordering on”. The reader will probably agree that but for the word “island” the description would accurately suit the district in the south of modern Portugal which is the part of Atlantic coast closest to Gibraltar (See map of Western Europe). – Lee translates, and makes a footnote that by saying “at the centre of the island” Plato meant “midway along its greatest length”. In the Latin translation the word media is used here, which means “middle”. In Plato’s original the phrase kata de meson is used, which means “around the middle”, “approximately in the middle”, with the word meson from mesos usually implying the middle of a linear segment, while for the notion of “centre” another word exists. Besides, a long island, whose length considerably exceeds its width, must have two longer sides, and if it were really the description of an island, then an indication should have been given, the middle of which side is meant. So, without a stretch, this description could only be understood as the middle of a certain segment of the coastline. • secondly, makes it possible to assume that in relation to Atlantis the word “island” is used, because the central part of the city, surrounded by a canal (water ring) and situated on the top of the hill which used to be an island, historically continued to be called “King’s Island” or “Poseidon’s Island”. Hence, possibly, the use of the word “island” in relation to the whole city and country by all who transmitted the narration, including Plato. The climate of the territory in question for a number of reasons was extremely favourable. • Firstly, the vast territory in close proximity of the ocean was only slightly elevated above the ocean level. • Secondly, the plain was protected from northern winds and the cold influence of the ice sheet covering Scandinavia, exactly as in Plato’s narrative, by the mountains, albeit not high, which encircled it. • Thirdly, there are reasons to believe that a warm current, now known as Gulf Stream – North Atlantic Drift, washing the shores of western and northern Europe, used to wash the shores of the territory in point. The argument about whether America is implied in this passage or not, can be veritably endless. But such a vision of the ocean surrounded by land, is strange, to say the least, for Plato of Greece or even for his imagination. Indeed, Greeks themselves did not know of America. So, this is a serious argument in support of the idea that Plato really possessed some information which had been lost long before his time, and that thanks to him, we have received uniquely ancient recorded information. The phased character of sailing to the “opposite continent” in itself suggests the idea of the not-too-high level of navigation skills. The manner of action described would be appropriate for the Vikings’ voyage to the island of Newfoundland, rather than for Columbus’s search of a westward route to India. It is well known that both ancient Egyptians and the ancient Greeks we know of, sailed the seas on their ships, keeping to the coast and never losing sight of it. The very look of ancient maps testifies to this. So does the fact that no evidence has been found, that either Greeks or even Egyptians were familiar with the principles of navigation used in sailing the open seas. There are no grounds to believe that matters were different as regards Plato’s Atlanteans and ancient Athenians. Taking into account these considerations, we can see that in Timaeus a very accurate description is given of the route from the west of Europe to the above-mentioned island of Newfoundland via Iceland, Greenland and smaller islands, which, given a lower level of the ocean, must have been more numerous on the way. 1.The first explanation is rather traditional: a tidal wave (tsunami) following some natural calamity destroyed the city and killed the armies, and then all the artifacts had been slowly (over thousands of years) swallowed by the ocean. Meanwhile, up to now, very little is known about the reasons for the beginning and the end of the Ice Ages. The only thing that is evident is that for the mean temperature on the planet to rise, a vast amount of energy is required. In considering the temperature charts for various regions, we can observe that the warming that marked the end of the last Ice Age was more pronounced, dramatic and durable than all the previous ones (See graphs of climate change). This cataclysm could have been connected with the release of a vast amount of energy. In that case, the speed of the glacier melting and the rise of the ocean level could have been considerably higher than is widely believed now. Another argument to back the thesis that none other than the rising of the ocean level was the catastrophe that Plato described, is that the relief of the plain in point in the west of Europe was of such character, that the rising of the ocean level by one metre could often have meant the retreat of the coastline by kilometres. I am sure that even if the submerging lasted several years, the eye-witnesses (and victims), who were on a flat plain, must have perceived it as a very fast sinking of all the land they could see, from horizon to horizon (See again map of the Celtic Shelf). At the time when the last Ice Age ended, the rising level of the world ocean resulted in the submerging of a sizeable territory in the west of Europe (which is now known as the Celtic Shelf) and where the centre of a highly developed civilisation and of a powerful state was situated. This state (or a commonwealth of states) controlled the whole Atlantic coast of Europe (and maybe North Africa), a considerable part of the Mediterranean coast of Europe and Africa and, possibly, could also sail the territories along the Atlantic coasts of North Africa, North and Central America. Along with this state, there existed other states in areas with a mild climate, in particular, “Ancient Athens”, which entered into a coalition with other peoples of the Mediterranean to jointly resist the expansion of Atlantis. All the artifacts of these civilisations have either been irretrievably lost or are now on the bottom of the sea, that is why they have never come to the notice of the modern archaeological science. Neither have written records of that period been preserved, and the earliest written recording of the events of that period was made at least a thousand years later, in Egypt, on the basis of the still remaining folk memory, but it was already very general in character and imprecise. It was pure chance that it came to the notice of Plato and was recorded by him in the dialogues Timaeus and Critias. Throughout the whole chain of the passing down of this narrative, distortions and inaccuracies have accumulated, which, coupled with lack of corroborating evidence from other sources and archaeological finds, has determined its present ambiguous status. The hypothesis we are putting forward, like any other hypothesis, is only a concept, and needs to be corroborated by facts. Since so far no such facts, recognised as trustworthy, have been found, it is evident that this is where the main problem lies. But it seems to me that there are fairly wide possibilities for solving it, even without resorting to the analysis of legends and myths, or looking for cultural parallels, which in itself is very interesting, but can hardly bring forward irrefutable proofs. Certain conclusions can probably be drawn on the basis of analysing the data of such scientific disciplines as comparative linguistics and anthropometry, though in order to obtain acceptably reliable findings a gigantic volume of work will have to be done and a vast amount of information processed. And, last but not least, since the hypothesis deals with the submerging of Plato’s Atlantis as the ocean level rose, the most convincing evidence (if it exists at all) can be found underwater at depths from 50 to 160 metres. As far as I know, no systematic archaeological survey of the shelf at these depths has ever been undertaken by anyone. Neither is high resolution bathymetry of the area in question available (I contacted many oceanographic centres including UK Hydrographic Office, British Oceanographic Data Centre, Plymouth Marine Laboratory, IFREMER, NOAA, Defence Mapping Agency of the USA). 1.A sweep bathymetry survey of the area in question, using sonar and satellite navigation system, for the purpose of charting a very high resolution map. Analysis of the data thus obtained, using different methods, including computer techniques, to identify objects that could be of artificial nature. 2.If objects of this kind are identified in the area, organisation of underwater exploration and photographing them.